Żabka, Prof. Dr. M. M.
Born in 1955. 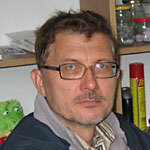 In 1978 graduated with MSc in Wyzsza Szkola Rolniczo-Pedagogiczna, Siedlce, Poland for the thesis on Salticidae of Vistula river slopes in Plock area. In 1983 graduated with PhD at the University of Poznan, Poland, for the monograph on Salticidae of Viet-Nam (supervised by J. Proszynski). In in 1991 awarded with DSc degree for taxonomic and zoogeographical research on Salticidae of Australia and Pacific islands. Employed in the Department of Zoology of Akademia Podlaska, Siedlce, Poland. Research interests: taxonomy and biogeography of Salticidae of the Oriental, Australian and Pacific Regions. Publications: about 50 revisions of genera and regional studies (Viet-Nam, Australia, New Guinea). Current projects: Salticidae of Australia and New Zealand.